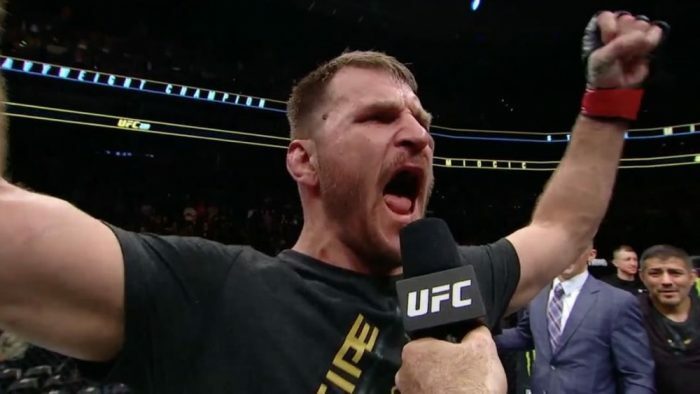 UFC heavyweight champ Stipe Miocic reacts to Conor McGregor's recent tirade through the Barclays Center in Brooklyn that ended with him being arrested and charged with assault and criminal mischief. Stipe Miocic will be the first to admit he’s not Conor McGregor nor is he going to try to be anything like the Irish superstar. That’s especially true when Miocic saw what McGregor did just a couple of weeks ago when he assaulted a bus full of fighters that left two athletes injured and out of their bouts at UFC 223. Add to that, McGregor ended up being arrested and charged with three misdemeanor counts of assault as well as a felony charge for criminal mischief. The entire situation unraveled after McGregor decided to retaliate against Khabib Nurmagomedov when he was involved in a separate incident with his teammate and friend Artem Lobov earlier in the week. The reigning UFC heavyweight champion was asked for his opinion on the McGregor situation and while he sympathizes with having the back of your friends, there are much better ways to go about it. McGregor has received a ton of criticism for his actions in Brooklyn but Miocic says that wouldn’t even be his biggest worry if he tried to do what the former lightweight champion did during his tirade. As of yet, McGregor has received no formal punishment from the UFC for his actions but he does have a court date in June back in Brooklyn to answer to the charges that he faces after the melee in April.